*Note, reroute issue effects the 100 mile race only. 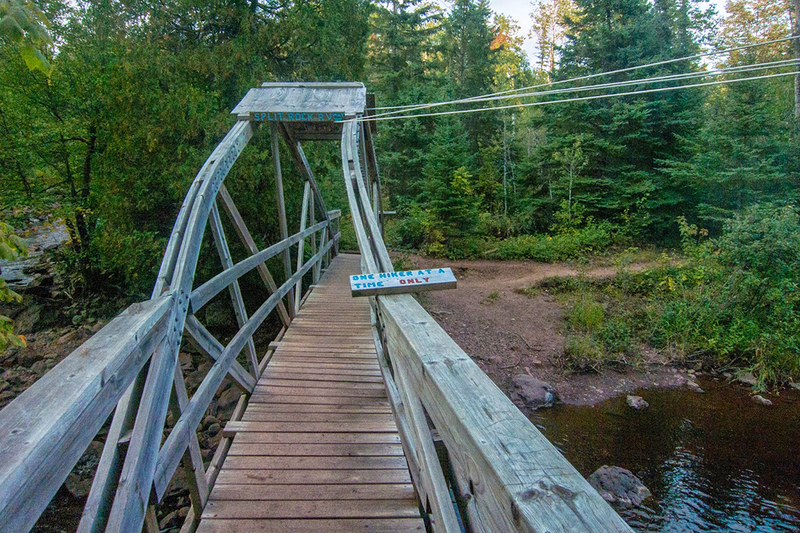 The good old Split Rock River bridge between the race start at Gooseberry Falls State Park and the Split Rock Aid Station had seen better days and has since been dismantled and is awaiting replacement. As a result of this bridge outage we have identified two potential Superior 100 Mile Trail Race course reroute scenarios for this years race, as follows. 1.) If there has not been much rain the week of the race and there is not a likely rain event in the forecast overnight, then we will will fjord the river near the old bridge site. Depending on recent precipitation and associated river levels the crossing spots identified will likely be between shin and knee deep with only moderate current. Due to the location of the best crossing spot, that allows runners easy access and will not incur river bank erosion – the distance for the Gooseberry to Split Rock section will be reduced by approximately .4 miles. 2.) If the water is high from rain events the week of the race and / or there is the potential for significant rain overnight (before the start of the race) we will cut out the Split Rock River Loop entirely, making up the lost distance on the paved Gitchi Gami bike path that the race already starts out on and leaving the distance to the first aid station (Split Rock) relatively unchanged from 2016. While it is tempting to make up the lost distance with single-track trail, there is not an opportunity to do so in the first section of the race and pushing this to another / later section would have a cascading effect on aid station open times, aid station closing times, cutoffs, volunteer shift times and general race logistics. Regardless of the route choice, it will be well marked, there will be additional course markings and additional volunteers / course marshalls to facilitate the changes. The race will remain in excess of 100 miles and the overall segment distance to the first aid station will remain relatively unchanged. As always our number one priority is runner safety, closely followed by runner experience and we feel that this will plan will allow us to achieve both goals. Regardless of the route, it happens so early in the race that it will be a distant memory as you cross the finish line on Saturday. Notification of what route will be used will be delivered during the 100 mile pre-race meeting in Two Harbors on Thursday night after the race director and trail marking team assess the river crossing and mark the determined route on Thursday.